This blog post was re-published on HuffPost. Recently, while on a date, the subject of service animals came up. My date spoke of a female coworker of theirs who would occasionally bring a service dog to work. 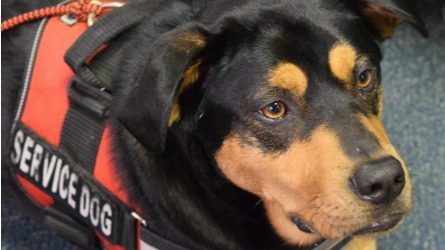 They expressed their disbelief about their coworker’s disability – an anxiety disorder – because she “seemed fine” most of the time, and didn’t always bring her service dog to work. “If she can come in some days without her dog, she must not really need it,” they reasoned. I quickly changed the subject, too nervous to mention my own service dog, who I had left home that evening. As a person with multiple invisible disabilities (including autism, PTSD, and anxiety), having a service dog has made a huge difference in my life. My service dog helps me get oriented to new spaces and navigate crowds and places with loud noise, and also knows how to respond if I have a flashback, meltdown, or anxiety attack in public. Having my service dog with me can make the difference between being unable to leave my apartment and going out to do daily life activities. Having the companionship and stability of my service dog also affects how much I can get done in a day; a task that may take all my mental energy to accomplish on my own, leaving me unable to do any other tasks the rest of the day, becomes much more manageable with my dog at my side. For many years, I internalized the idea that I should try my hardest to not “look disabled”. This idea caused me a great deal of mental anguish and lowered my self-esteem. I felt incompetent for not being able to do the same activities that others seemed to accomplish so easily. Only after I began to embrace my disabled identity was I able to look into options that could improve my quality of life. A service dog was one of these options, and having mine has given me a level of independence I’ve never had before. I too have invisible disabilities. People question me all the time because I don’t look disabled. It’s maddening to be accosted by someone who demands information that is not theirs to have. I’ve been doing this for a while and my dog goes everywhere with me unless it is a danger to her or is not allowed under the ADA laws. I.e. She doesn’t go into a hair salon because she has to lie on the floor and many people carry staph or strep germs on their hair. Not safe for the dog. I’ve had surgery while I’ve had a service dog and she doesn’t go into an operating room because it’s not possible to make her sterile. Also, she might get in the way and get hurt or compromise my care.) People get used to her when she is always with me. We walk into BooK Club, which is held in the clubhouse of the local Country Club, and peopIe greet her by name and think nothing of it. I’m offering advice because I remember so many conversations with nasty strangers. The first issue is, if you fit under the ADA guidelines can be found at ADA.gov, only certain people have standing to ask the two permitted questions. 1. Is that your Service Dog? 2. What services does she provide? THAT IS ALL that anyone who has standing is allowed to ask. In addition, no one can make you demonstrate what your dog does. A person with standing would be a person such as a manager of a restaurant, mall security, hotel clerk. They have the right to ask. You have the responsibility to answer. Random strangers have no rights to object. The stranger will think that they can, but, under the ADA law, they can’t. When you are asked these questions, you must answer truly. That means that you have read and understand the law as well as a reasonable lay person can be expected to understand it. AND that you are complying with all the provisions. It means that you have been to you own physician who will state that you have the conditions that you assert you have, that those conditions are indeed a disability, AND that you need the dog to serve you in ameliorating those conditions. Your dog’s vet has to have seen your dog and be willing to say that this dog, your dog, is well and is able to do the things which you require of it. You are not required to show this documentation to anyone, but it must be true all the same. In many states it is a crime to impersonate a service dog owner. People who chose to break the law always make life harder for those who don’t. Think of things like the Tylenol poison debacle/increased waste in packaging; shoplifters/those horrible dye packs that stick through your new jeans. People who throw a vest on their dog so that they can bring it to work make my life, and yours much more difficult than it has to be. I carry cards with me all the time. I purchase them from http://www.sitstay.com. The cards outline what the existing law is and what a person with standing can do in response. It doesn’t always work, but most of the time it helps. I now have one in my hand most of the time. I don’t answer their questions unless they are the proper party to be asking and then I answer truthfully along with handing them the card. Also, there is a difference in rights between a Service Dog and and Emotional Support Dog. That distinction is hard for folks to understand, but it is important that you understand. If you get into difficulties, let your dog do her job, then try again. Remember to turn on your camera or have a friend do it. There are fines for noncompliance. If you want clear legal advice about this it might be wise to see a lawyer who specializes in the field. Wishing you all the best. I think that if your service dog has made your life awesome then dontbstress over what others think. At the end of the day it’s your life and you have every right to feel fantastic. All the narrow minded people who need to you to justify your need for a service dog need to take a deeper look at themselves before questioning others. What do you think of the laws proposed in several states that make it a crime to lie and say a pet is a service animal? Will the laws embolden the people who persecute you to call the cops? Or will it help you? (My worry is these laws will result in cops being called on legit service animals, and people who use service animals having to pay a lawyer to prove their animal is legit, possibly over and over). Thank you for this article. I’m sorry for the ignorance of people who are unable or refuse to comprehend invisible illnesses, yet I deal with them every day. I’ve even had friends and family make comments about my service dog – that’s the worst! My little partner has made a huge difference in my quality of life and that’s all that matters at the end of the day! You will find out all you need to know about Service Dogs, Tasks and how you can even train your own dog to become a legitimate Service dog at: http://www.IAADP.ORG. International Association of Assistance Dog Partners.